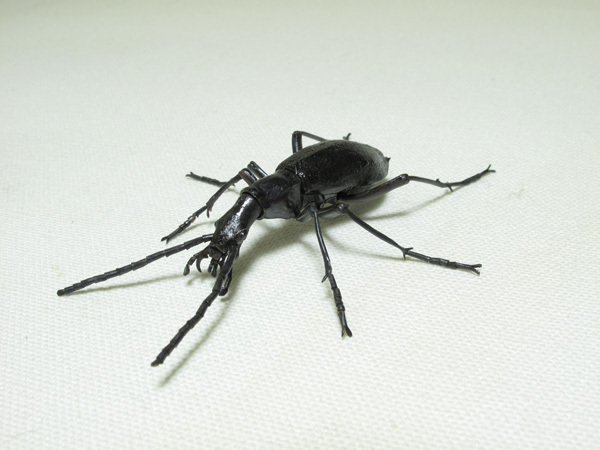 Damaster blaptoides is commonly called “Japanese ground beetle" -in Japan, called Maimai-kaburi-. The imago’s length is between 3 and 7cm, with the slender figure like a gourd tapered toward the head, has the developed mandibles (jaw or mouth part) and long tentacles range the half length of its whole body. The legs are thin yet sturdy that allow brisk movement . The abdomen and the back are dome-shaped that have the sharp-edged forewings. Generally, the color is black, but there are wide differences between habitats, and the subspecies. After emergence from pupa, the forewings are fused with the back skin, therefore can not be opened, moreover, the hindwings have been degenerated into filaments, thereby disabling flight, thus consequently saved it from interbreeding, that allowed the independent diversification, on the other hand, is said that increased the number of the subspecies. In dangerous situations, it shoots out the liquid with the strong acid smell from its caudal part; the components of which mainly consist of methacrylic acid and ethacrylic acid, is quite stimulative substance that less damages human’s skin, but injures the eyes with terrible pain resulting inflammation; the shooting direction is not only backwards, but also upwards, therefore need to be cared not to get closer nor hold with force. To prey upon snails, they bite the molluscous part with the large mandibles to injects in the digestive juice, and eat the digested mulluscous part. As mentioned above, their bodies are shaped slender tapered toward the head, seem to be developed for the predation on snails hidden in the coiled shell. The Japanese common name Maimai-kaburi (means snail head) is from the way of their preying -thrusting its head into snail's shell- that looks wearing snails’ shell on their heads. To ease eating the molluscous part, sometime they rip up the aperture (opening in the shell) with the large mandibles. The lavae also eat snails, only need to prey once a year, is the sufficient amount to glow them to the next stage, thus indicates they need just two snails each to become a imagos after the incubation. For the people whom dislike any bugs, they may have many elements to be disliked: slender yet spiky limbs, long tentacles, glossy black body, etc...; but among some particular people in artworld, they are quite popular as the fact that are often being the motifs of paintings or sculptures, and the objects of photographs. The artist myself was enchanted by their figures and evolution into non-fly insects specialized for running the ground, that is what I wanted to make since long time ago.